Samsung SmartThings Outlet - Smart plug - wireless - ZigBee - whiteThe Samsung SmartThings Outlet turns any regular three-prong outlet into a smart, controllable power outlet. By plugging in this portable device, you'll be able to control and automate lamps, electronics, and small appliances from another room or another country directly from the SmartThings app. 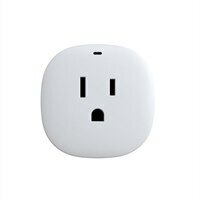 The Samsung SmartThings Outlet turns any regular three-prong outlet into a smart, controllable power outlet. By plugging in this portable device, you'll be able to control and automate lamps, electronics, and small appliances from another room or another country directly from the SmartThings app.